Alabama National Champions… again, The Bachelor is back, The oldest Minnesota Vikings fan, Mike Babone checks in & an amazing Maz revelation. HBO’s new Bowie documentary, The Last Five Years, has some great footage from late in David’s life. Maz defends Kevin Spacey & loves OJ… but he’s not a fan of Oprah or most of Hollywood. The College Football National Championship game was great last night. ESPN had big rations too, but the NFL’s are down. The President was also there! 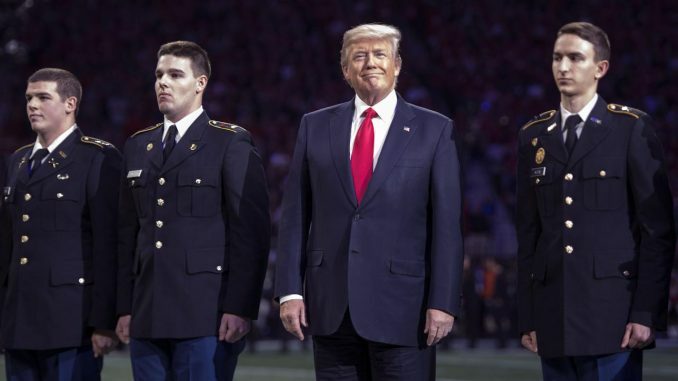 Some think Trump doesn’t know national anthem. F*ck Trump seemed to be a theme, but not from Bo Scarbrough. Maz has a long story that was quite well told about how he proposed. It’s quite revealing. We call “Buzz” who knows something about Kwame Kilpatrick’s prison stint here in Michigan. Another blast from the past as Mike Babone left Marc a voicemail. He “just happens” to have a new venture. Arie Luyendyk is, like, the Bachelor. He’s, like, taking some girls home to meet his, like, family & drive in, like, a demolition derby. The New American Idol won’t show the losers that think they can sing. RIP Olivia Nova. Another star gone too soon. SIST: Did that guy ever list his house? SISeriousT: Why are funerals so expensive? BaTonya Harding almost walked off Piers Morgan because he pointed out the obvious. Millie is 100 years old! Millie is a Minnesota Vikings fan! Millie got free playoff tickets! Millie actually answered her phone! Maz gets Drew to impersonate Kennedy… again… somehow. Today in Rock/History: Cyndi Lauper first female to be nominated for 5 Grammys; Gene Simmons sued for slander; Aussie woman arrested for stabbing husband after playing Elvis on repeat; Claude Nobs, the founder of the Montreux Jazz Festival & Deep Purple muse, died; David Bowie died of liver cancer; The trial of Lorena Bobbitt began; The Sopranos debuted.